Although I already figured out that the Grossglockner was closer to Sankt Johann than to Berchtesgaden, I decided to not cycle up that climb today. I remembered all too well that it is very demanding and after yesterday’s Marmotte, I was really not ready for it. So, I cycled from Sankt Johann to our apartment in Schönau – just over 65 kilometers, mainly ‘flat’, with only one climb. Not the easiest of climbs though, as I remembered from my 2012 trip. Upon leaving Hallein, it throws 10% grades at you and as it already started to be pretty hot, I was sure glad when I reached the split with the Rossfeld and finally started the flying descend towards Unterau. 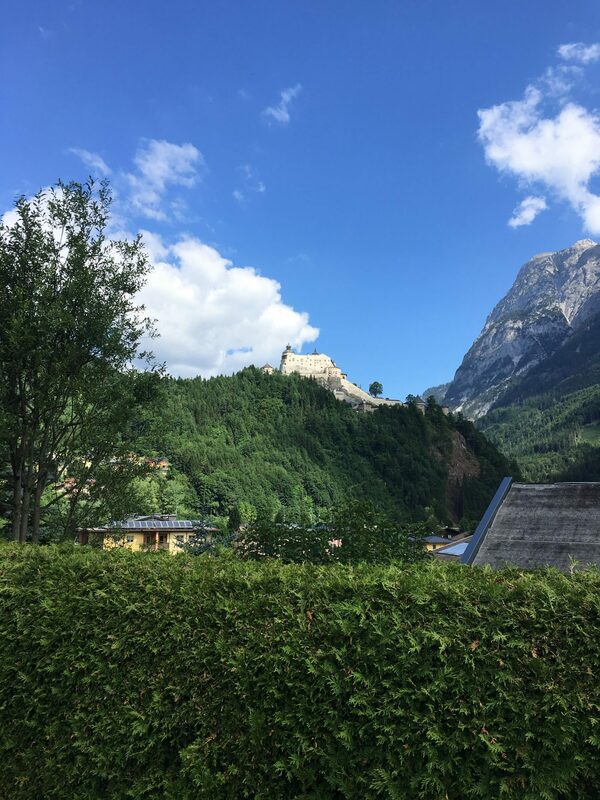 After that, only the short climb out of Berchtesgaden to Schönau was worth mentioning, but the final part to our apartment showed wide open and breathtaking views of the area. Since the weather forecast for the Grossglockner did not look very promising for the rest of the week, today was ‘Grossglockner or bust’ day. The transfer to Bruck – by car – was scenic and around 9:30 I got on my bike at the same spot as in 2009. Having done this climb once before, I knew what I was in for: after the warm up to Fusch, you get a short 10% section from the marker at the Embachkapelle to the Bärenschlucht. Whenever there is a hairpin, the grades will briefly drop, but in between those, it’s often over 12% – as it was considerably warmer than in 2009, I was sweating so hard, I had trouble drinking enough to prevent dehydration. I did, but I had to take a long break to get over the nausea and reconsider my further options. After a bite, having recovered at least a bit, I decided that going on (down) all the way to Heiligenblut or Pockhorn to get back up from that end, would be a suicide mission. So, I settled for ‘just’ the remainder of the climb to the Hochtor, return from there and get up to the Edelweissspitze. At the Hochtor it was a staggering 18 degrees Celsius, as opposed to the near freezing temperatures back in 2009. I briefly enjoyed the views down the other end, which was not possible in 2009, and returned. After the cobblestone climb up to the Edelweissspitze – ‘only’ 1.8 kilometers at 10% – I was equally able to enjoy the views. I had another break there, after which I descended all the way down to Bruck. More info on the Grossglockner High Alpine Road – or my trip up in 2009 – on this page and a ‘best of’ picture gallery here (Google+). Believe it or not, but today I actually had a rest/recovery day. I cycled to the German – Austrian border, over the B305 alongside the Berchtesgadener Ache. A mere 35 kilometer round trip, with no climbs, just the section out of Berchtesgaden back to Schönau was noteworthy. In the afternoon we went to visit the ‘Kehlsteinhaus’, which is more commonly known as the ‘Eagle’s Nest’, Hitler’s 50th birthday present. You can read more about it here (Wiki). 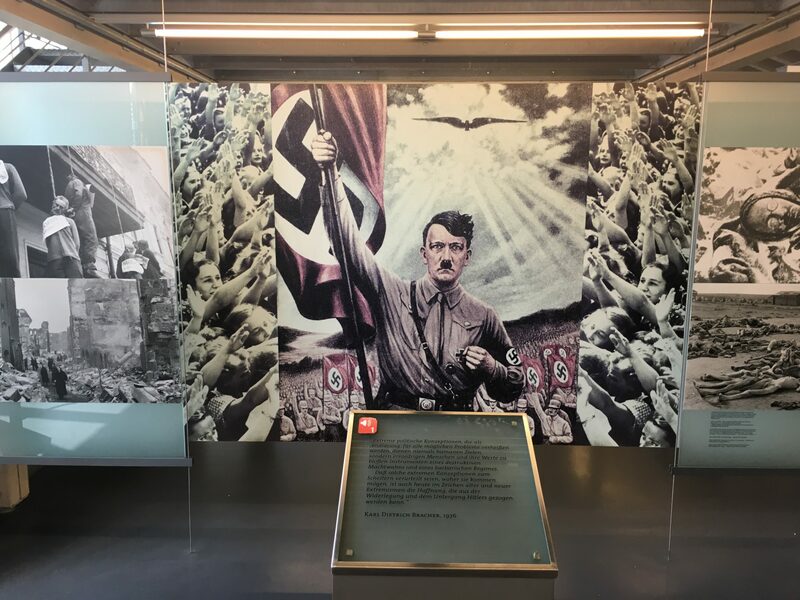 After that, we went to the exhibition at the ‘Dokumentation Obersalzberg’ – this was quite a confronting place to walk around, but it is a well balanced exhibition, showing the various aspects of the Nazi history. You can read more about the center here. The road up to the Eagle’s Nest, the Kehlsteinstrasse, was actually on my to do list for a cycling trip, like it was in 2012. I couldn’t cycle it then because it was still closed due to snow. As it turned out, during the ‘summer’ season – April to September – it is officially forbidden for cyclists to go up there. And during opening hours, when the colonies of 5 buses full with tourist go up and down every 20 minutes, passing each other halfway, it would be impossible to do so, as there simply is no room for a bus to overtake a cyclist. However, I was told by locals that cyclists actually do go up there, but not until the buses are gone (after 6 PM). Having seen the road from within the bus, considering the heat, I decided it was not going to happen this year either. As the temperatures were only rising, I decided I would only cycle (short trips) early in the morning for the remaining two days. The Rossfeld Panoramastrasse was an obvious choice, as it leads up to the highest (view) point in the area – besides the Eagle’s Nest – and offers spectacular views. Unfortunately, you can only get to the start of the Panormastrasse via the ridiculously – insanely – hard Vorderbrandstrasse or Salzbergstrasse, or the just very hard Auerstrasse. So, I took the easy way up there, although that’s only relatively speaking, as it is also the longer route. And, besides the steep bits, everything else up to and past the toll station is also a minimum of 7 to 8%. Anyway, the views were as rewarding as I hoped for, although I didn’t have much left by the time I reached the ‘summit’. 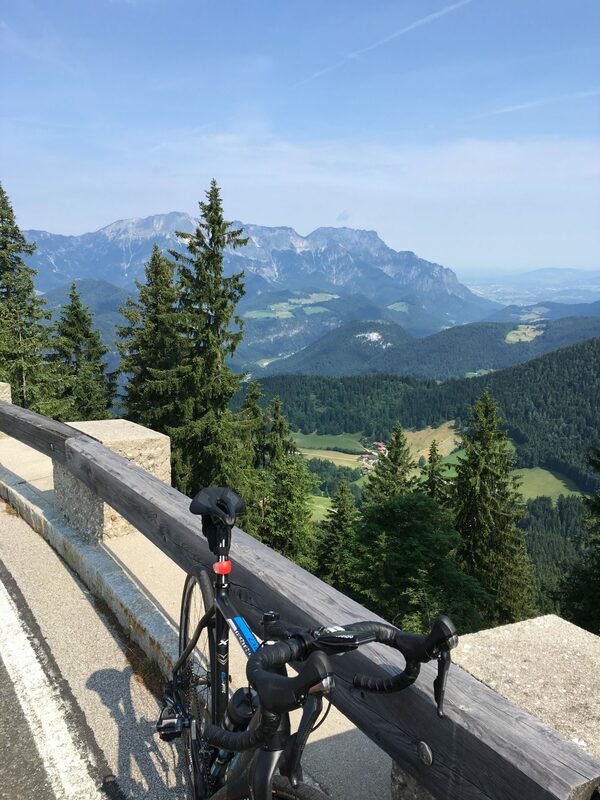 One more ride before we would head back tomorrow – knowing that I also had a 160 kilometer tour coming on Saturday, in the south of my country, I planned a tour that didn’t avoid climbing altogether, but which was not offering too many hard bits. I passed the 1,000 meter mark again on the Schwarzeck, which I also climbed (twice) in 2012. The descend to and the climb out of Bad Reichenhall to the Thumsee and in fact all the way up to were I turned towards the Hintersee, was along roads a little too busy for my taste, but not knowing the area that well, means you either start wandering, or just stick with it. 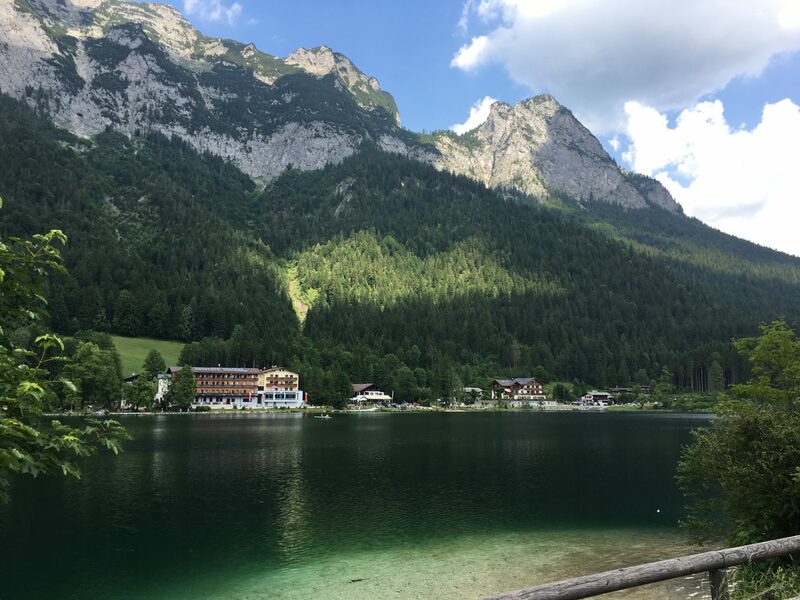 That little ‘detour’ past the Hintersee was actually enjoyable and also the stop we had there offered one of the best strudels I had this week – rhubarb too, with ice cream. My conclusion in 2012 was that the beautiful Berchtesgaden area has a lot to offer, not just for cyclists. However, for an average climber like myself, from a pancake flat country, the climbs there are a little too steep. In Italy or France, you can get away wit averages of 7 to 8%, but here, the average is more often close to 10%. Then again, I’m pretty sure that if you look for them (and/or prepare yourself better) you can find less steep climbs and cycling routes with more agreeable grades and quieter roads. Best of gallery here, on my Google+ pages.